Ferguson reports replacement for the bath 2 shower pan will be 20 August. 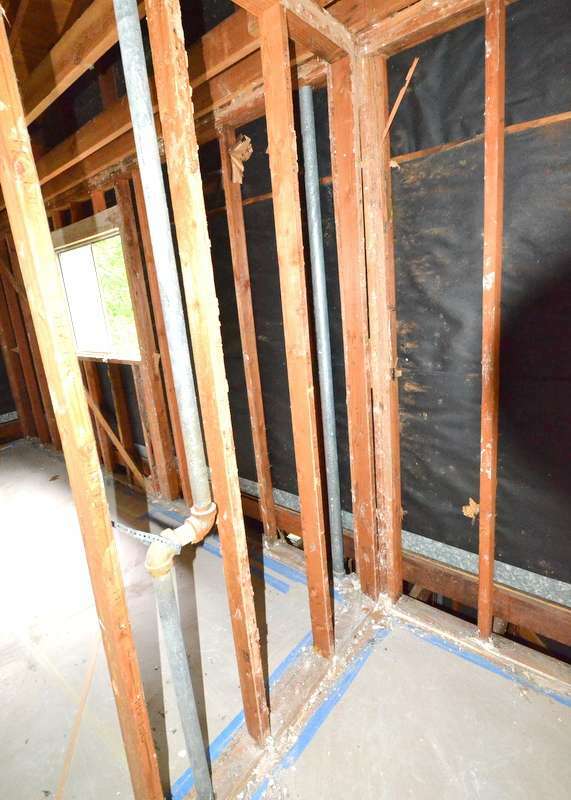 Without the shower pan, Ron Dahlke and the City of Austin inspector opted to delay the framing inspection — because the plumbers are still punching holes in lumber. The painters caulked the bottom plates where the lumber met the slab, sealing against air, water and insects. 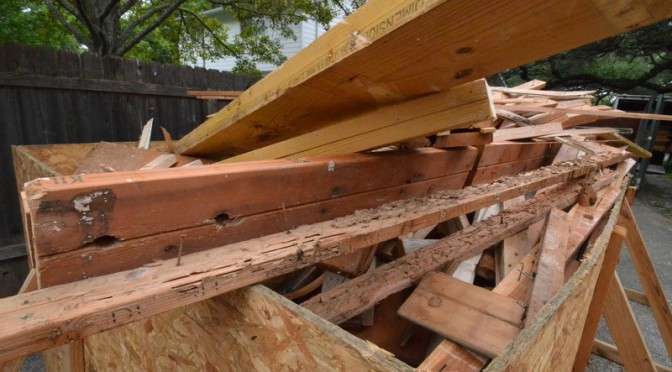 If you build new today, the framers unroll a thin layer of foam that adheres to the bottom of the bottom plate — the foam was not invented in 1968 when Emerald Hill was built. 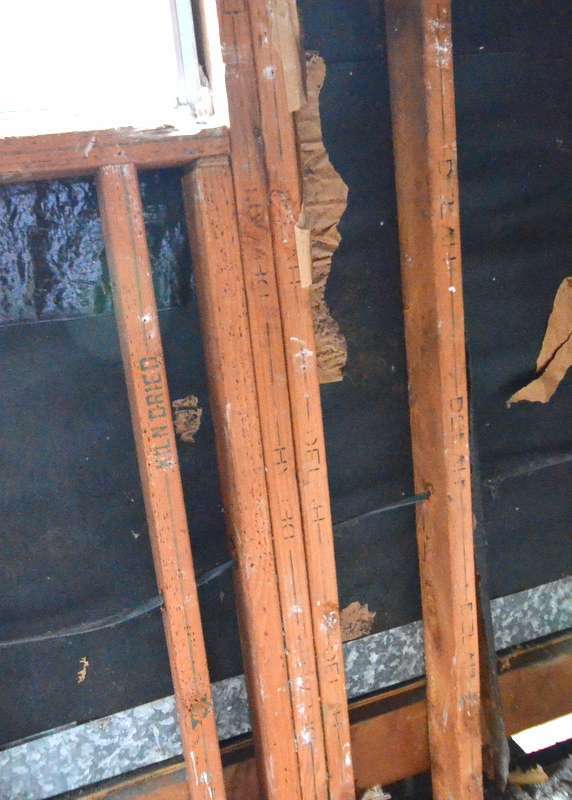 Silicon caulk is the alternate to ripping down the house and starting over with new lumber and foam. The painters caulked today because Ranserve will spray borate on the exposed framing of the first floor. Termites don’t like borate. Steven and Jacquela and Ron don’t like termites. 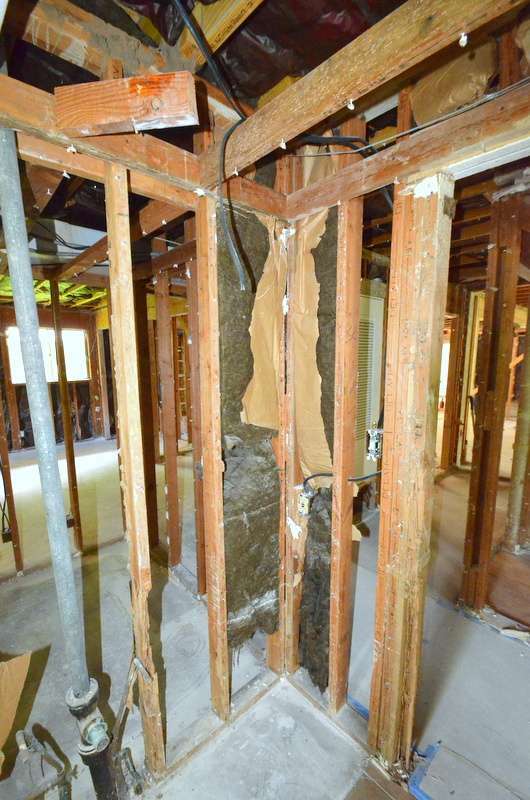 We’ve seen the damage termites do. 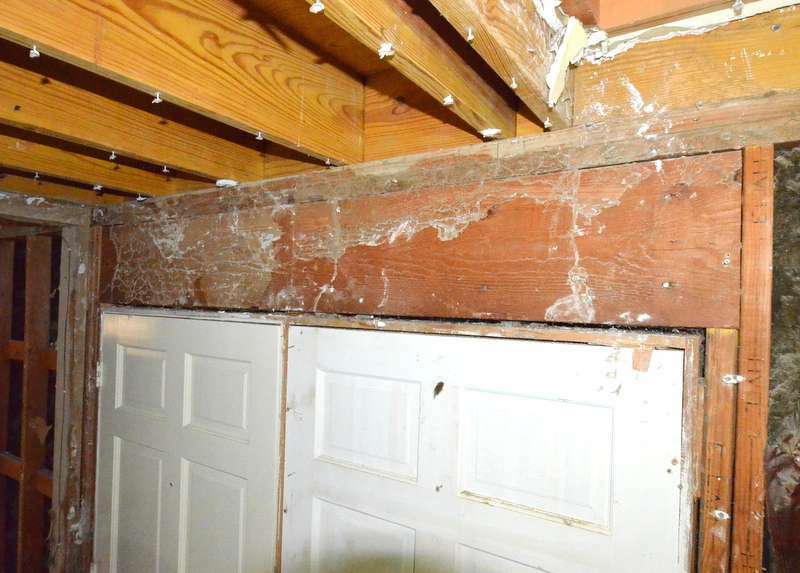 The framers were forced to replace a lot of lumber that the bugs chewed through. 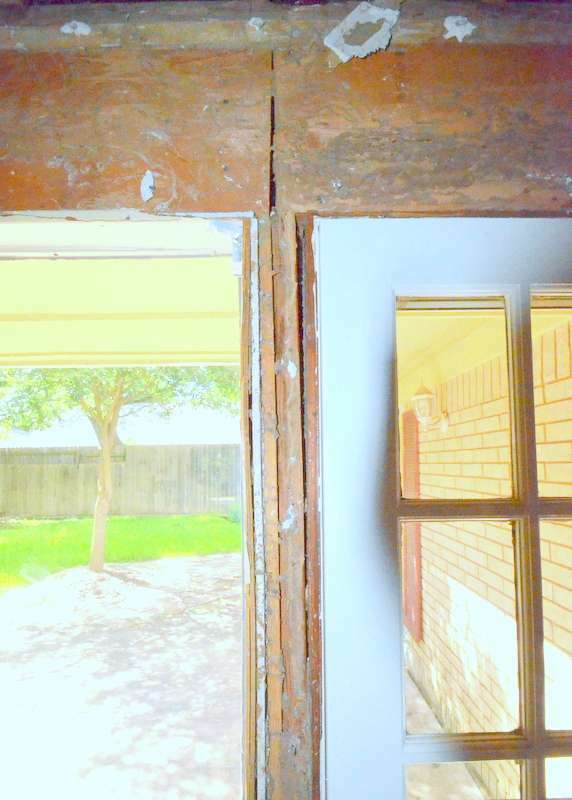 The borate is a line of defense — and it is also required by the Austin Energy Green Build program. 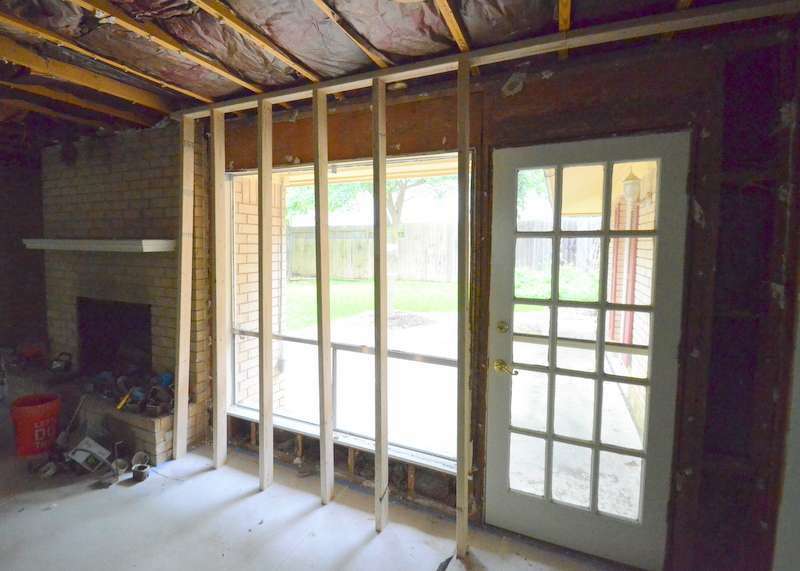 Ron now plans to re-attempt the framing inspection for Friday this week, or early next. 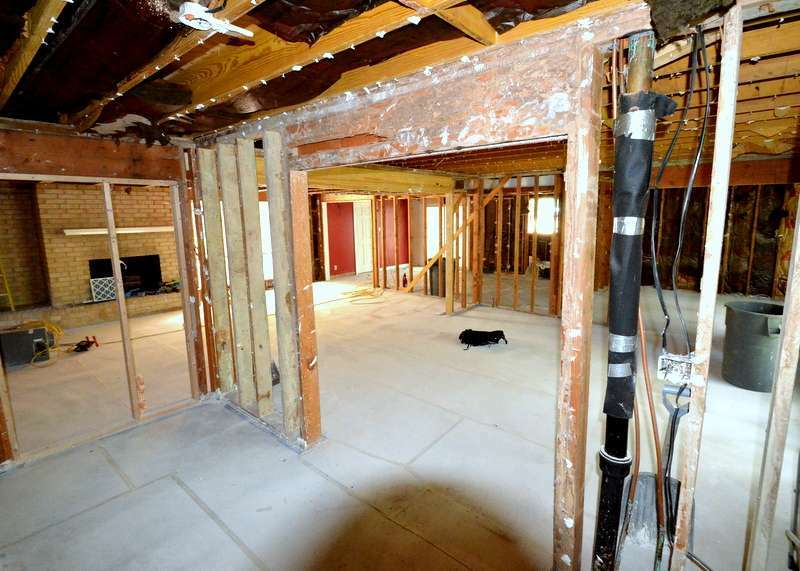 Ron put the insulation team on alert to start next week as soon as Emerald Hill passes the framing inspection — with drywall anticipated for the first week of September. Steven received and is reviewing updated quotes for door handles and hardware, and for tile — and the potential third garage bay. Mud tubes and termite-chewed lumber, where it belongs, in the trash pile. It’s Saturday. The demo crew has the day off. Time to go hunting for more sign of termite damage in a quiet house. Left side of the window in bedroom 3 is chewed up. 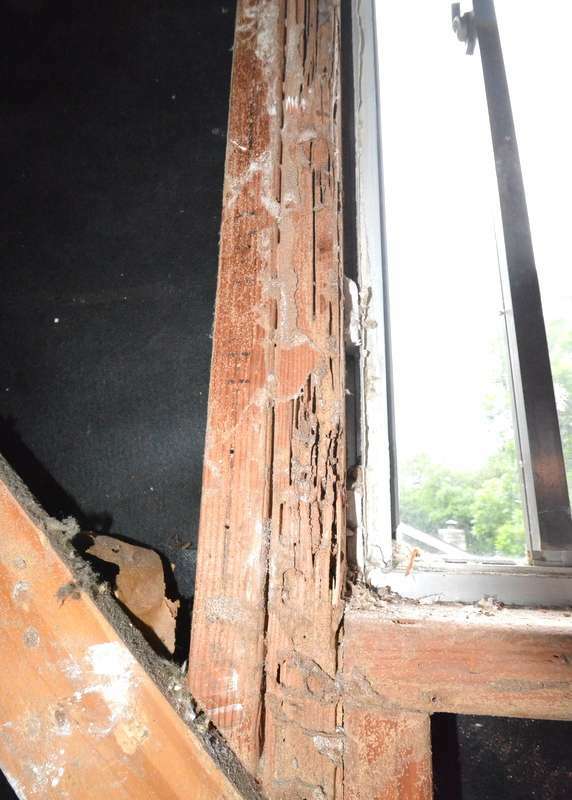 Rotten wood at the lower right corner of window. It looks like the two vertical studs at left, under the window, are bored through. 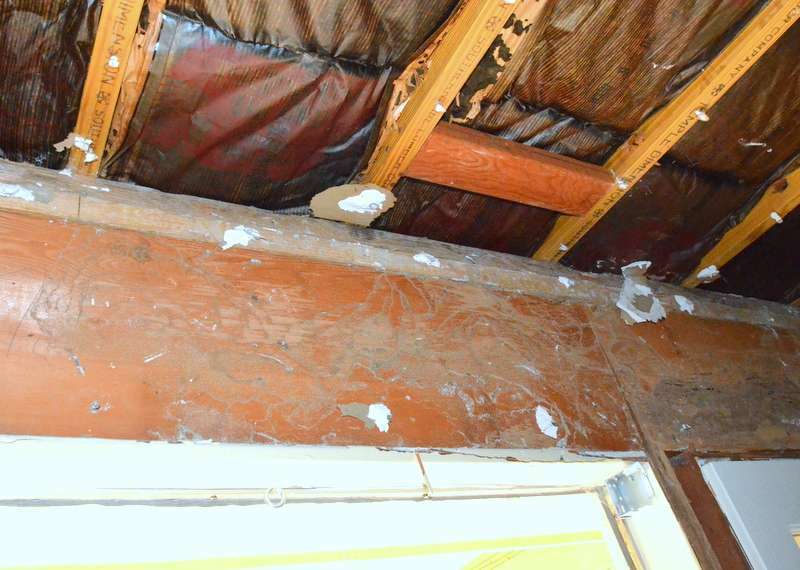 Termites used the galvanized pipe at left of photo as a highway to the second floor. Stud to the right of the pipe is trashed. Count one stud to the left of the stud at right side of photo — that stud is also trashed at exterior wall at rear of bedroom 4. Mud trails across the header above the front door. Mud trails at the top plate of the stairway wall. Shouldn’t there be a 2×4 sitting under the vertical studs to serve as a horizontal plate? Steven has to ask. The stud on the right is penetrating the cardboard that is supposed to protect the wood floor. 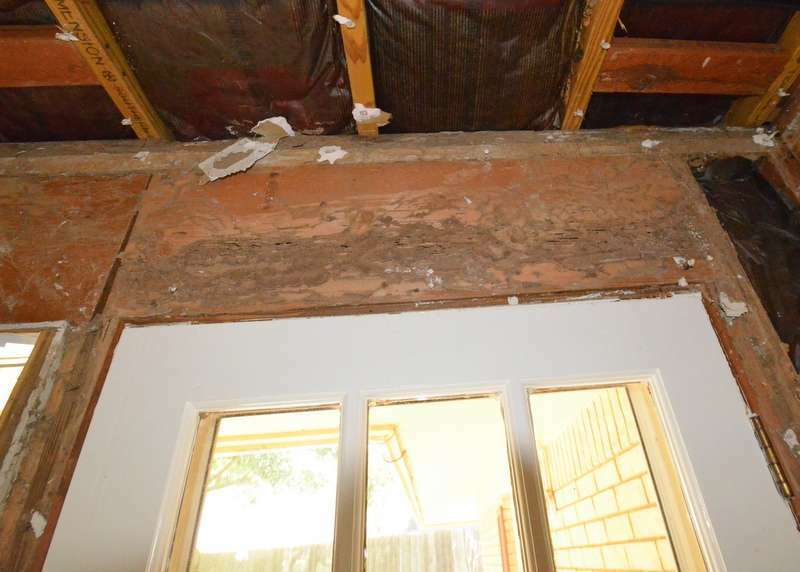 Termites have taken out structure at the back door and windows. Just in case, Ron and the demo crew braced the second floor. 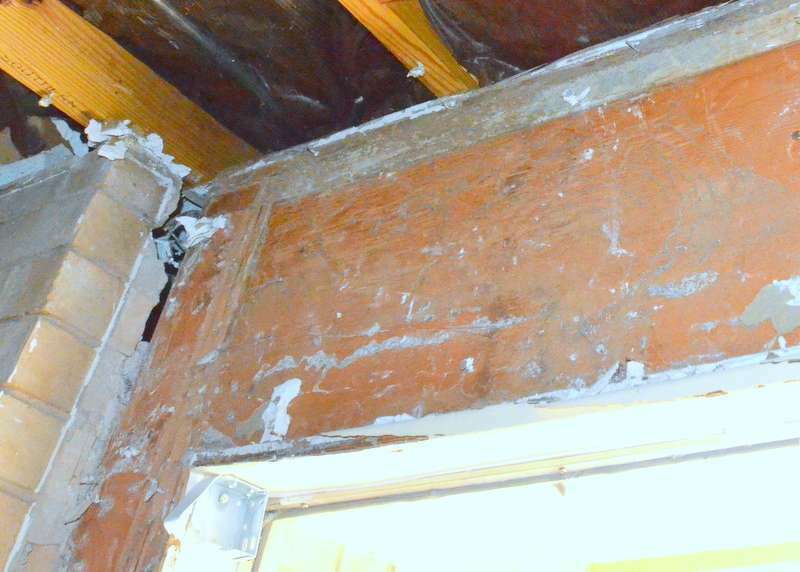 Demo continues to reveal termite damage. Again, there appear to be no live colonies — knock what’s left of the wood. Carefully. Ron and Steve are not surprised by the damage. We expected this in a 1960s vintage house. 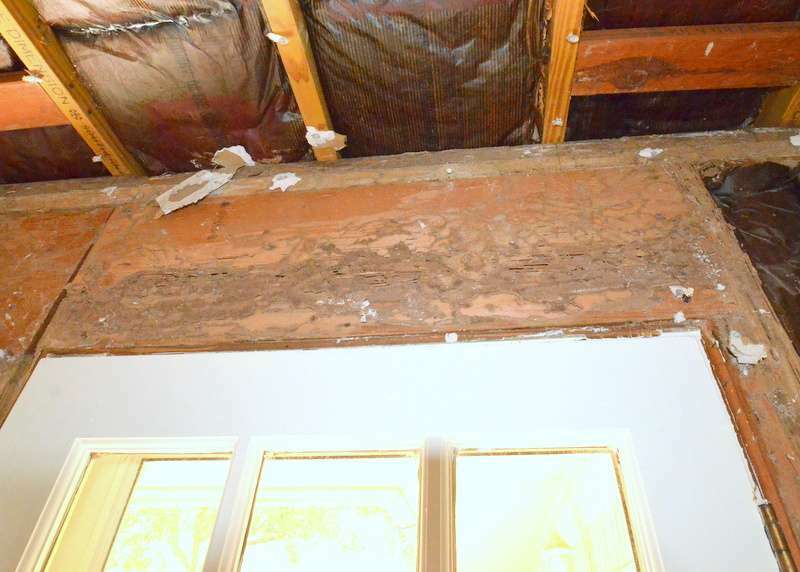 The damage, it appears, so far, is localized to the rear windows and doors at the back of the family room, to the header over the passage between the foyer and living room, and to bath 2. Let’s take a tour of the trail of mud tubes. 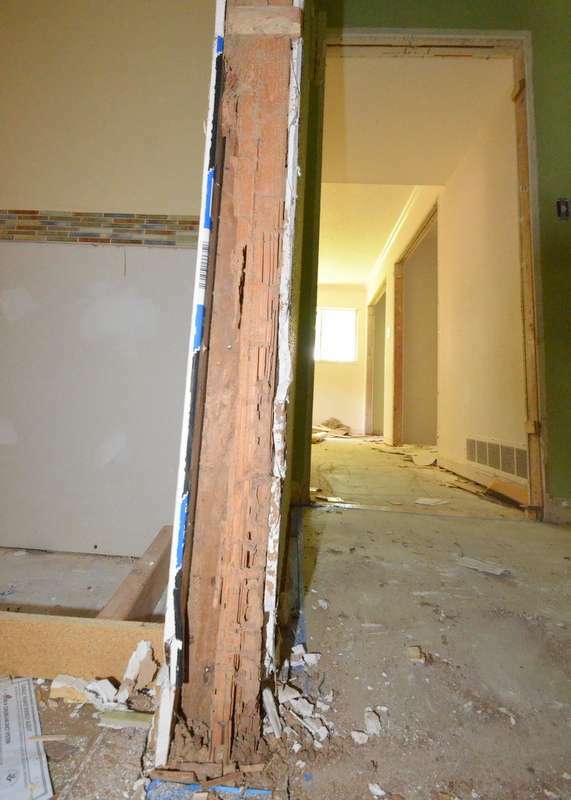 The jack studs to the right of the back door are compromised. Brown mud tubes traverse the header over the back door. 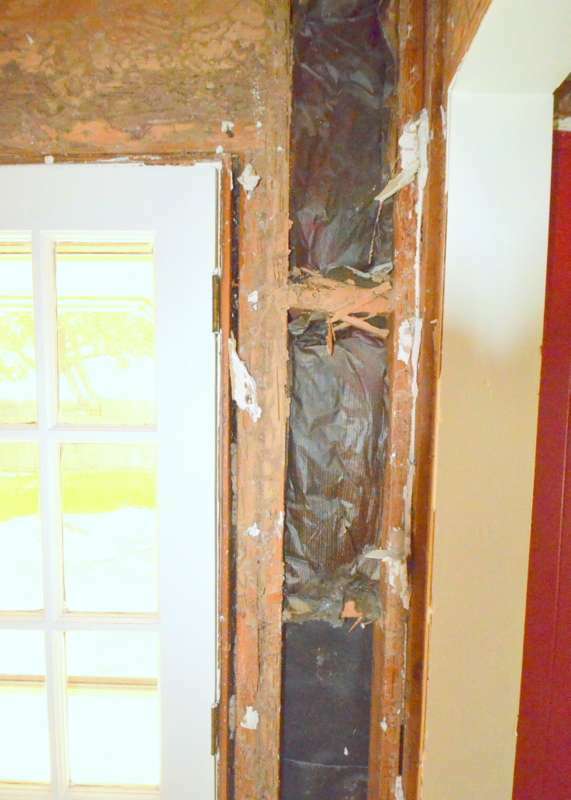 There’s not much structural support remaining in the jack studs between the back door and back windows — to the point that the door and door frame, and the window frames, appear to be carrying some of the load of the second floor. As evidence, look at the V-shaped deflection gap between the headers over the windows at left and door at right. This may also explain why the back door does not close properly — the weight of the second floor is crushing the door frame. Steve aked Ron to put up temporary supports in advance of inspection by the structural engineer. Mud tubes traverse the header over the back windows. Mud tubes continue across the header to the king stud. Steven suspects this is not even framed properly. The photo appears to show no jack stud holding up the header; he’s going to have to take a second look. The base of the studs is eaten away at the left side of the back windows. Bath 2. Steven hopes this is the worst of it. The stud to the right of the galvanized pipe is eaten through. Mud tubes wrap all around the headers in the ceiling. And the stud at the doorway, on the right side of photo, basically does not exist. 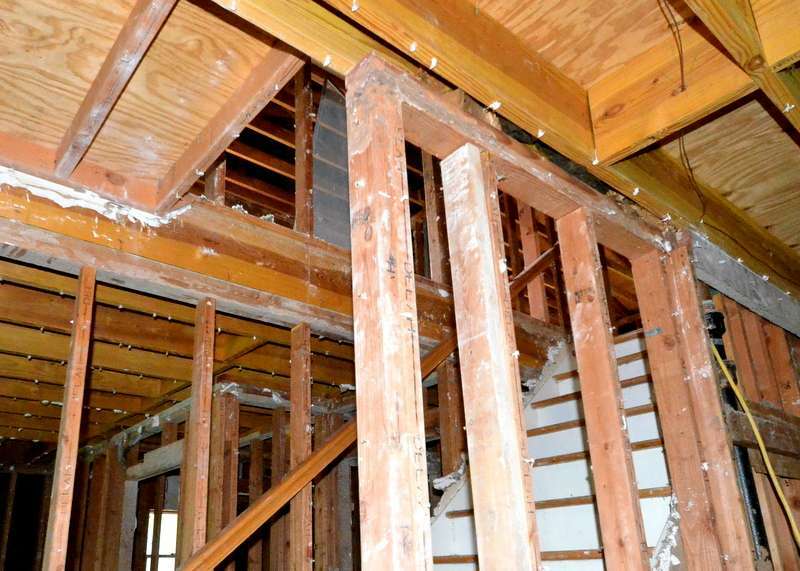 Mud tubes traverse the header at the passage between the foyer and living room. 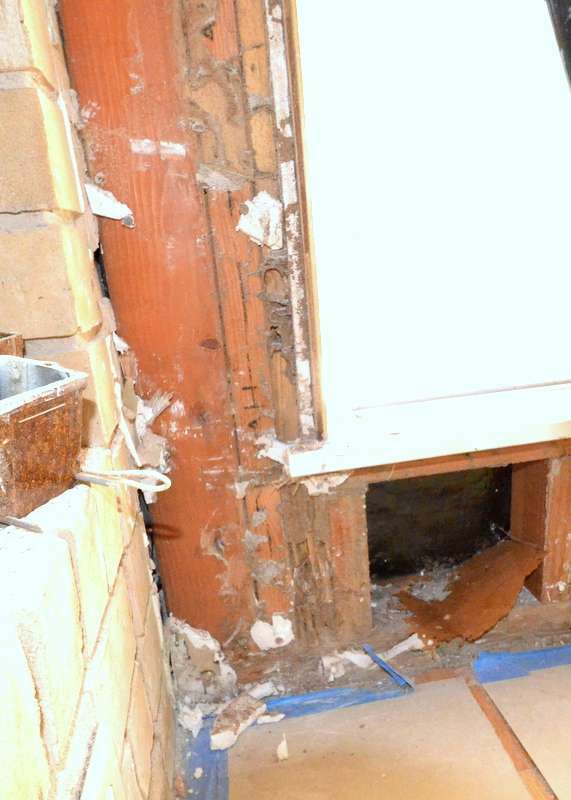 How do termites get in? Ron gave Steve a lesson. Here are holes in the foundation under one of the HVAC closets. Those holes are open to dirt under the concrete slab. Bugs just crawl up wire-and-pipe highway and don’t have to knock. This is the way they built in the 1960s. Building science has come a long way since. 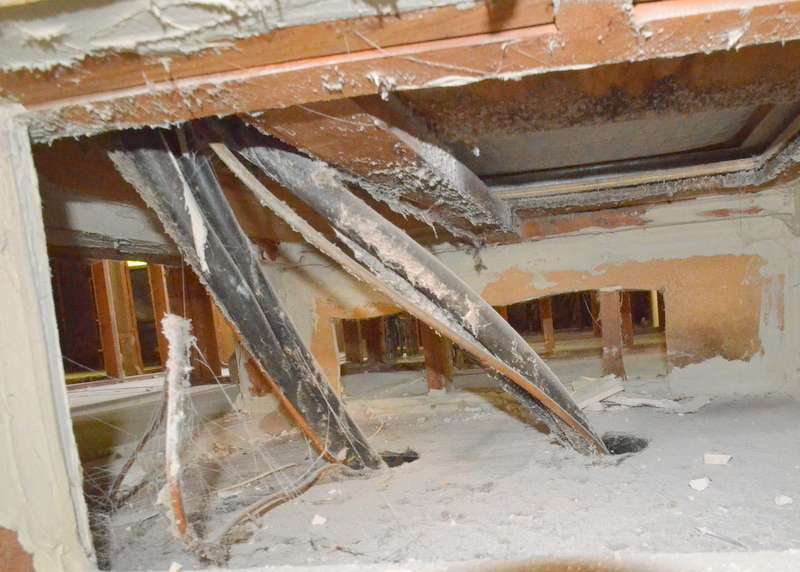 Today, builders would wrap the cables and copper lines inside PVC sleeves sealed with stainless steel mesh fine enough to block bugs and critters — among several approaches. The header over the back door is all chewed up, and it looks like the jack and king studs are also going to need replacement. This is what’s left of one of the studs at what was the doorway to bath 2. The wood is gone.